Saturday Morning Slam 05-11-13 - WrestleCrap - The Very Worst of Pro Wrestling! So the rumor going around is that this show may be on the endangered species list, either being done until the fall or done until the end of time. This saddens me greatly of course, but fear not! My plan if the show is done for is to go back and review ALL previous SMS that I’ve not reviewed on the site previously, which would take us in the way back machine to 2012. I have all shows from October 20 to present, but will need to some help finding the older stuff. So if anyone can point me in that direction, that’d be swell. At this point, I LOVE doing these recaps more than anything else on the site, save for The RD & Blade Show, so I don’t want to stop until I’ve covered the entire catalog of available material. 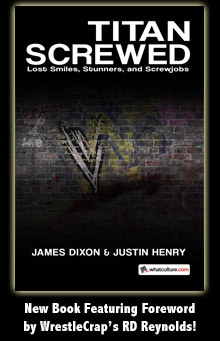 As I don’t have a ton of time right now to do new material for the site since I am in the midst of working on Death of WCW: 10th Anniversary Edition, covering this show works perfectly for the time I have right now. So yeah, help me out if you can. With that out of the way…let’s see what the E has in store for us today. Oh good. I love Randy Horton matches. If only Jim Neidhart were here, we could have a Seusstastically good time. But fear not – according to our narrator, Slam GM (Garanimal Model) Mick Foley is going to make history today. HISTORY he says. I’d scoff at such hype, but hey, the guy doesn’t sound like he’s going to fall asleep today as he did last week when I thought I heard him snoring after noting we were getting a Jey Uso-Darren Young match. We should also take heart that last week’s show was terrible, which means that this week’s should be quite good. That’s the kind of parity booking I don’t mind. At least when it’s a week that is supposed to be good. We start backstage, where we get Mr. Socko and The Cobra having a sock to sock staredown. I was hoping for a Sherri Lewis run-in, but a quick Google search reveals she died back in 1998, so that won’t be happening. I should also note that Mick Foley MUST be reading these columns. Seriously, look at that shirt; it’s blatantly obvious he’s taking the Garanimals thing to heart! Sadly, the two are interrupted by Jinder Mahal, who gets pummeled by various music puns by our heroes. Can’t lie – I chuckled when Mick dropped a “That’ll change their tune!” and I howled when he followed it up with, “Do you see what I did there? I made a musical reference! !” Mahal asks if Foley thinks he’s a comedian, which leads to Foley attempting to shill his stand up shows. Remember when I said Foley would be great on this show? There’s your proof. Off to the arena we go and I hold my breath as we spin the Saturday Morning Slam Commentator Wheel of Misfortune. Pro: she looks very cute giving us the Peace sign. Con: Her shirt is so tight that I fear she may collapse. Pro: Her shirt is so tight that I fear she may collapse. Yes, I’m fickle like that. 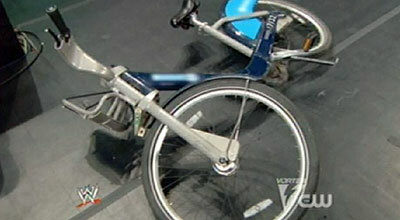 Santino decides to ride a bicycle down to ringside. Just as I was about to ask why, exactly, he would do this, Alicia goes into a 2-minute explanation of not only why, but what type of bike it is, who invented it (!!! ), and the political backstory (!!!!!!!!!!) of said bicycle. She was going into such great detail I was half expecting her to give us the PSI on the tires, but Josh jumps in to tell us Santino was riding “ET Style.” I don’t think he’s ever actually seen the movie. It would look like this. Eh, maybe we’ll get that the next time WWE goes to London. Jinder makes his way to the ring, and in the most dastardly heel move in the entire run of this progrem, he kicks over Santino’s bicycle. What an a-hole. The match begins, and Santino does some power rope running, which Jinder counters with a shoulder block. Not to be deterred, Santino does a nip up. A nip up that fails in spectacular fashion. I’ve missed Santino on commentary on this show. Pretty sure I say that every single week. That one move may have made it up for it. So Jinder wallops Santino for a while as we get more bicycle history from Alicia who notes, “I’ve done my homework.” Josh then keeps talking about Alicia’s seat, to the point that I think the word “seat” must be carnie for something. Like her can. The finish comes as Santino successfully completes a nip up (to a huge pop) then hits The Cobra for the win. Fun match, prob would have been better with Heath Slater in there, but I ain’t complaining. Especially not when Santino POWER CYCLES out of the arena. And to the back we go, as Mick attempts some Brogue speak with Sheamus. This is spot on that Mrs. Deal asks why Foley is “talking like a pirate”. I love my wife. It winds up leading to the pair singing ‘Danny Boy’ in a loud and terrible manner. And Randy Horton does not approve. Anyway, the pair will be taking on (yes, you guessed it) The Prime Time Players in our main event. We get a Spotlight on the pair, who I guess are now named “The Celtic Vipers”. Sheamus and Horton enter the ring first, followed by the Prime Time Players who Alicia describes as “BOO-GEE”. I’m sure I misspelled it. Hopefully next time Alicia is on she will tell us the exact lettering making up her made up word. Anyway, it means flashy and classy. Here’s to hoping they can defend their SMS turd. I swear that was a legit typo. Here’s to hoping they can defend their SMS TURF. Also, Titus O’ Neil paints his nails according to Alicia. Why was THAT not covered in their SMS Spotlight a couple weeks ago? We go to commercial and when we get back, it’s a Don’t Try This with Sheamus. He utters “Don’t Try This” approximately 437 times in the span of 60 seconds, most of which is footage of him hanging out with folks in the crowd. He must really hate those people. When we get back to the arena, we discover that the Players have taken over due to something. Not sure what it is, as they show Horton being thrown into the corner post, but then switch to Alicia & Josh prior to impact. We even get a replay of their reaction, which does nothing but reaffirm my love for this show. Young continues to beat on Horton, telling him that “This is our house!” That’s it, Young, protect that turd! Unfortunately for the PTPs, Sheamus and Horton get the win as Randy hits the RKH. And yes, Steve Godwin, I did steal your joke. “What a morning!” Alicia exclaims. Agreed, great show this week. And I will be quite sad if this show is done for. And it appears to be as we get an ad for Dragon Ball Somethingorother that will be airing in the 10:30am SMS time slot. But as I noted in the open, we’ll survive Crappers. After all, that pie eating contest they did prior to Thanksgiving last year MUST be reviewed, and I am the man to do it!! 15 Responses to "Saturday Morning Slam 05-11-13"
You forgot to mention Alicia Fox equating 3MB’s musical talents to Hanson. Hopefully it’ll be back by August. Then we can start the show off with another champion who’ll have lost the title right before the show airs! I can’t believe Alicia Fox is younger than me. Damn. From what I’ve heard, the network is interested in retaining SMS, it’s just a matter of negotiations with WWE. I’m bummed, apparently SMS isn’t on anymore on CW in my area…I swear I’ve watched CW every Saturday morning for the last month since I work Saturday afternoons now) and I have yet to see an actual episode. RD’s recaps are the closest I get to actually seeing it. And now that the show may not be on anymore (the Wikipedia page lists the show’s run ending yesterday, though I don’t quite trust it yet; after all, this is the same site that has declared RD dead multiple times), I will forever be doomed to a life of reruns. Not so bad when you think about it, especially if RD can track down those earlier episodes. last i read therez still talk about bringing the show back. why they wont keep airing new episodez thru the summer who knowz. but therez a positive feeling theyll bring it back this fall. we’ll see i guess. Last time I checked, “BOO-GEE” is a word black people use to describe rich black people who’ve “souled out to the man”. A lot changes in 10 years, though, so it probably means something else now. I thought I was the only one who remembered that! Yeah, that definitely needs to make a comeback. Santino “Hamburgler” Morella: the 2010’s answer to Repo Man. You missed another pro for Alicia Fox. Pro- She’s not Brad Maddox. Also I think Santino purposely screwed up the kip up. 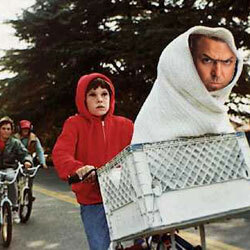 > …but Josh jumps in to tell us Santino was riding “ET Style.” I don’t think he’s ever actually seen the movie. Actually, he said that The Cobra was riding E.T. Style because Santino had it sitting in the bike’s basket. You know, with all the bike talk going on in the show, I have to wonder why Pee-Wee Herman didn’t guest host. I really hope that SMS doesn’t go away. I love these reports! I think it’s a black thing. Wait, so who ended up winning that SMS GM position anyway?